This course provides an introduction to computer programming focusing on how to design programs. We will learn the different stages involved in programming–from analyzing a problem, to coding that problem in a computer language, to testing whether that solution works. The course takes an active, hands-on approach to learning. Students will spend much of the class time exploring, experimenting, and evaluating code using their own laptops. Class time is divided between short lectures, individual experimentation with programming, working on code with a partner, team projects, and quizzes. During the first week all students will be assigned to permanent teams. Depending on the final class size there will be between 4 people per team. Teams are constructed so they contain people with a variety of skills including those with l33t skillz. There is no textbook for the course. Free online materials are listed in the resources section of this website. I am assuming that nearly everyone (perhaps 28 out of 30 students) has a laptop. You will be working with your laptop during a large percentage of our class. It doesn’t matter if your laptop runs Microsoft Windows, is a Mac, or an Ubuntu machine. It doesn’t matter if it is 5 years old. It also doesn’t matter how powerful it is–even a basic netbook will work. Don’t worry if you don’t have one. There will be approximately 4 short multiple-choice quizzes given during the course. Each quiz will be taken individually, then, immediately after, the same test will be taken as a team. 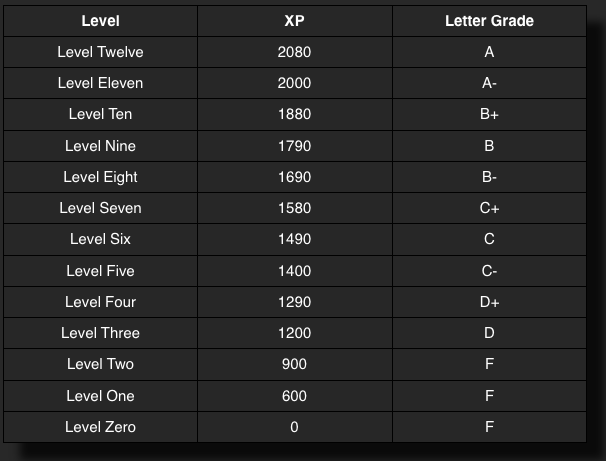 Each individual quiz is worth on average 50 points; each team quiz is also worth on average 50XP. There are no make-up quizes. Approximately nine individual programming challenges will be assigned throughout the semester. Each is due by email submission to submit.o.bot_AT_gmail.com within 14 days of its distribution. Challenges submitted within seven days will receive 10% additional XP. Assignments are due at 11:59pm on the due date. An assignment is considered late if it exceeds the deadline by any amount of time–an assignment one minute late is late. To accomodate students of different abilities some challenges may come in different editions: the standard edition and the hacker’s edition. You gain more XP by completing the hacker’s edition. You may choose, challenge to challenge, which edition to turn in. Program runs and produces correct results. Moreover, the program illustrates good algorithmic design – 60XP. The final project is your chance to take what you have learned and implement some cool idea you have–a Scratch app, a web service, whatever. So long as the project uses what we learned in class, you are free to do what interests you. Rarely are real software projects a one-person effort and for the final project you can collaborate with one or two other students. Further details of the project will be given mid semester. Unless I specify that the work needs to be demonstrated in class, you will be submitting your individual programming challenges and other work via email to submit.0.bot_AT_gmail.com. You can either attach your code as an attachment to the email. I am hoping that there will be some of you who look over the above list of activities and think, wow! that’s exactly what I want to do. I expect some of you will look at that list and panic. Programming in front of a teacher–that seems scary and high stress. You may hate math and feel you have no talent there. You may feel that you are not computer geeky enough to take the class. Rest assured, this is not the case. I designed this course to enable people from a variety of backgrounds to succeed. You’ll be doing the majority of your programming in class and much of that time will be working with other students. If you have problems we will solve them quickly. The computer language we will be using, Python, is easy to learn but yet very expressive. I expect students to attend classes regularly. That said, attendance is not taken and no XP will be awarded based directly on attendance. If you are going to miss a class, please be courteous and inform your team mates.